Iran’s president says culture and not the nuclear weapons will make the future of the world. Mahmoud Ahmadinejad, who was addressing the Meeting of Cultural Representatives of Asian Cooperation countries, said that cooperation, synergy, and coordination were major factors of providing security, peace and national progress. “Asia is rich in human capabilities and talents necessary for progress,” Ahmadinejad added. “Great civilizations have dawned in Asia. Developments in Asia definitely will have the first role in shaping future international order, and any movement in Asia will have effects all over the world,” he asserted. Ahmadinejad believed that those who used atomic bomb, killing more than 250,000 human and rendering millions of others invalid lacked human culture. “In World War I and II, more than 70m people died. The number of those who decided to go to war to plunder other nations’ wealth and solve their economic problems hardly amounted to 100. Iraq and Afghanistan were invaded, and a president raged a war to dominate over oil in Asia and solve his country economic problems, and in a course of a decade, a million were killed or injured,” Ahmadinejad explained. “Your coming together in the name of culture is a sacred mission. To solve economic and political issues, we should improve culture. Asia is the cradle for culture, and I believe that your cultural movement soon will be a global current,” he said. 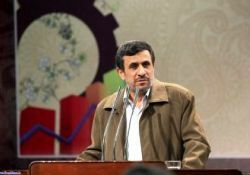 Ahmadinejad expressed his hope that the meeting would be the source of a great change in Asian nations’ cultural relations. “Culture will make the future and not atomic weapons,” he asserted.